Almost every day from October to May offers pleasant beach weather, but the very best months for the beach are from December to April. 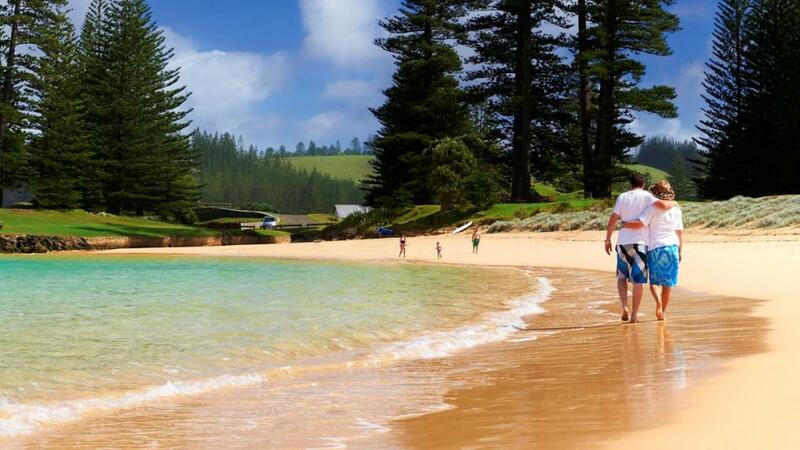 With the exception of Emily and Slaughter Bay, Norfolk Island's 32kms of coastline consists of a few secluded sandy beaches tucked away at the base of high cliffs. Though you will not feel you are becoming sunburned, you should protect against it - the total lack of pollution gives the sun an extra kick. Read our handy guide - Beach & Sun Safety Tips. Emily is the safest swimming spot on the Island, in fact its probably one of the safest swimming spots in the world. The sparkling crystal clear waters of Emily are protected from the breakers and the southern ocean by a reef just off the Lone Pine headland. The beach is popular among families with young ones and if your looking for the ideal daily swim spot or somewhere calm for a snorkelling adventure then Emily is your best bet. There is a pontoon in the bay that makes for a nice breather while getting that daily swim in. On a calm day, Slaughter Bay is a great spot for snorkelling and if the swell is right the waves pick up nicely for a surf on the reef. The marine life on the reef is abundant with colourful tropical fish quite common among the coral. Anson Bay is Norfolk's most spectacular beach. Being nestled in to the bottom of one of Norfolk's many steep cliff faces makes Anson less accessible and more secluded than other beaches on the Island. The walk down can be a bit hairy but if having a beach to yourself to explore is what your looking for, then it it will be worth your while traversing the track to the bottom. Anson gets some good waves through for surfing and care should be taken when swimming as the shore drops off quite rapidly and you could find yourslelf in deep water before you know it.